The 2016 Denver Broncos season is the franchise's 47th season in the National Football League, the 57th overall and the second under head coach Gary Kubiak. The Broncos enter the season as defending Super Bowl champions, and will attempt to become the first team since the 2004 New England Patriots to win back-to-back Super Bowl championships. The team underwent numerous roster changes as well as an off-season and preseason that was dominated by a quarterback controversy, following the retirement of Peyton Manning. February 12: Brian Callahan, who had served as the Broncos' offensive quality control coach since 2010, was hired as a quarterbacks coach with the Detroit Lions. February 16: Klint Kubiak, son of Broncos' head coach Gary Kubiak, was hired as the offensive quality control coach, replacing Brian Callahan. Klint Kubiak previously served as a coaching assistant with the Minnesota Vikings from 2013–14, and was a wide receiver's coach at the University of Kansas in 2015. On October 9, shortly after the Broncos' Week 5 loss to the Atlanta Falcons, head coach Gary Kubiak was rushed to a Denver-area hospital, after experiencing flu-like symptoms and extreme body fatigue. According to executive vice president/general manager John Elway, Kubiak had been feeling ill prior to the loss to the Falcons, and following a precautionary MRI and CT scan, Kubiak was diagnosed with a "complex migraine." During a press conference at the team's Dove Valley headquarters on the following day (October 10), Elway announced that special teams coordinator Joe DeCamillis will serve as the team's interim head coach for the team's Week 6 Thursday Night game at the San Diego Chargers, while Kubiak underwent a doctor-mandated week of rest. The Broncos would wind up losing that game. This was the second time in three years in which Kubiak suffered a health scare. In November 2013, while serving as the Houston Texans' head coach, Kubiak suffered a mini-stroke after collapsing on the field during a game against the Indianapolis Colts. Indicates that the player was a free agent at the end of his respective team's 2015 season. On March 7, two days before the start of the 2016 league year, quarterback Peyton Manning retired after 18 NFL seasons. In his four seasons with the Broncos (2012–2015), Manning threw for 17,112 passing yards and 140 touchdowns, both second in franchise history behind John Elway. Manning also set numerous league records, including regular season passing yardage (71,940), regular season passing touchdowns (539), regular season wins (186 — tied with Brett Favre), single-season passing yardage (5,477) and single-season touchdown passes (55); Manning achieved the latter two feats in 2013. At the time of his retirement, Manning was the NFL's all-time leader in combined regular season and postseason wins (200), however, New England Patriots' quarterback Tom Brady tied that record in 2016. March 11: The Broncos acquired quarterback Mark Sanchez in a trade that would have sent a 2017 seventh-round selection to the Philadelphia Eagles; however, Sanchez was released on September 2, voiding the trade. April 9: The Broncos were involved in a trade that sent offensive tackle Ryan Clady to the New York Jets — see draft section below. October 25: The Broncos acquired tight end A. J. Derby in a trade that sent a 2017 fifth-round selection to the New England Patriots. 1 2 The Broncos traded their first-round selection (No. 31 overall) and their original third-round selection (No. 94 overall) to the Seattle Seahawks in exchange for the Seahawks' first-round selection (No. 26 overall). 1 2 The Broncos traded their original fourth-round selection (No. 130 overall) to the Baltimore Ravens in exchange for center Gino Gradkowski and the Ravens' fifth-round selection (No. 144 overall). 1 2 3 The Broncos acquired the No. 157 selection (fifth-round) in a trade that sent one of their seventh-round selections (No. 235 overall — previously acquired in a 2015 trade that sent offensive tackle Chris Clark to the Houston Texans) and offensive tackle Ryan Clady to the New York Jets. The Broncos later traded the No. 157 selection and their original seventh-round selection (No. 253 overall) to the Tennessee Titans in exchange for the Titans' 2016 sixth-round selection (No. 176 overall) and 2017 sixth-round selection. ↑ The Broncos traded their original fifth-round selection (No. 169 overall), along with their 2015 first- and fifth-round selections and guard/center Manny Ramirez to the Detroit Lions in exchange for the Lions' 2015 first-round selection. 1 2 The Broncos traded their original 2016 sixth-round selection (No. 207 overall) and their 2017 sixth-round selection to the San Francisco 49ers in exchange for tight end Vernon Davis and the 49ers' 2016 seventh-round selection (No. 228 overall). All undrafted free agents were signed after the 2016 NFL draft concluded on April 30, unless noted otherwise. On August 12, safety Shiloh Keo was suspended for the first two games of the 2016 season for violating the league's substance abuse policy. The suspension was a result of a DUI arrest in Idaho in February. August 12: One day after the Broncos' first preseason game against the Chicago Bears, wide receiver Bennie Fowler revealed that he suffered a fractured elbow after blocking a punt. Fowler missed the first two games of the season. August 15: Defensive end Vance Walker suffered a ruptured ACL in his right knee during practice, and was placed on the season-ending injured reserve four days later (August 19). October 2: Quarterback Trevor Siemian suffered a sprain to his non-throwing shoulder, during the Broncos' Week 4 win over the Tampa Bay Buccaneers, resulting in backup quarterback Paxton Lynch, the team's first-round draft selection, making his NFL debut during the Broncos' Week 5 loss to the Atlanta Falcons. October 24: Running back C. J. Anderson suffered an injury to his right knee during the first quarter of the Broncos' Week 7 win over the Houston Texans, though he returned in the second quarter and played the remainder of the game. Two days later (October 26), media reports indicated that Anderson missed practice and sought multiple medical opinions on his knee. After an MRI revealed that he suffered meniscus damage, Anderson was placed on injured reserve, and will miss a minimum of eight weeks. Also on October 24, linebacker Brandon Marshall suffered a hamstring injury, and missed the team's Week 9 loss to the Oakland Raiders. November 6: Defensive tackle Derek Wolfe suffered a hairline fracture in his elbow during the team's Week 9 loss to the Oakland Raiders, and missed the team's Week 10 win over the New Orleans Saints. Weeks 8–10: Cornerback Aqib Talib missed three games due to a lower back injury. December 1: Fullback Andy Janovich, the team's sixth-round draft selection, was placed on injured reserve, after undergoing ankle surgery two days earlier. Following the retirement of Peyton Manning, the Broncos underwent a process to select a new quarterback throughout the entire off-season and preseason. Brock Osweiler, Manning's backup quarterback from 2012–15, signed with the Houston Texans as a free agent. Mark Sanchez was acquired in a trade with the Philadelphia Eagles, and the Broncos selected Paxton Lynch during the first round of the draft. Sanchez, Lynch and second-year quarterback Trevor Siemian competed for the starting quarterback position, with Siemian being named the starting quarterback for the start of the regular season and Sanchez being released on September 3. Following Sanchez's release, the Broncos signed Austin Davis. Director of Pro Personnel – Tom Heckert Jr.
recovered from a migraine condition. As the result of winning Super Bowl 50, the Broncos earned the right to host the Week 1 kickoff game on Thursday, September 8, in a Super Bowl rematch vs. the Carolina Panthers. The Broncos' 2016 schedule was announced on April 14. In a rematch of Super Bowl 50, the defending champion Broncos played host to the Carolina Panthers, in the opening kickoff game. This was the Panthers' their first visit to Denver since 2004. Following a fumble on the Broncos' initial possession, the Panthers grabbed the early lead, with a 14-yard touchdown pass from quarterback Cam Newton to wide receiver Kelvin Benjamin. The Broncos responded early in the second quarter, with a 28-yard touchdown by fullback Andy Janovich on his first rushing attempt. The Panthers then re-claimed the lead, with Newton rushing for a 2-yard touchdown, in an 18-play, 89-yard drive that took nine minutes off the clock. After the Broncos' offense went three-and-out, the Panthers added to their lead just before halftime, with a 44-yard field goal by placekicker Graham Gano. Following a scoreless third quarter, the Broncos pulled to within a 17–14 deficit on the first play of the fourth quarter, with quarterback Trevor Siemian connecting on a 25-yard touchdown pass to running back C. J. Anderson. On the second play of the Panthers' next drive, Newton was intercepted by cornerback Chris Harris Jr. at the Panthers' 38-yard line, giving the Broncos excellent field position. Ten plays later, the Broncos grabbed their first lead of the game, with Anderson rushing up the middle for a 1-yard touchdown at the 9:30 mark of the fourth quarter. The Panthers methodically marched down the field, hoping to re-claim the lead, but had to settle for a 36-yard field goal by Gano to pull to within a 21–20 deficit with 4:25 remaining. After the Broncos' went three-and-out, the Panthers had one last offensive possession. On the first play after the two-minute warning, the Panthers were facing a 4th-and-21 at their own 29-yard line, and a pass from Newton intended for Benjamin was incomplete, however, Harris was flagged for an illegal hands to the face penalty, giving a Panthers an automatic first down. With 47 seconds remaining, Newton was penalized for intentional grounding with the Panthers' at their own 47-yard line, however, Broncos' cornerback Darian Stewart was penalized for roughing the passer, with a helmet hit on Newton, resulting in both penalties offsetting. With only 14 seconds remaining, Newton completed a crucial pass to wide receiver Ted Ginn, Jr. at the Broncos' 32-yard line, setting up Gano for a potential game-winning field goal. After the Broncos called a timeout in order to ice the kicker, Gano's 50-yard field goal attempt sailed wide left, sealing the win for the Broncos. Andy Janovich became only the third player in Broncos' franchise history to score on his first rushing attempt — the other two are fullback Kyle Johnson and quarterback Bradlee Van Pelt, both of which occurred in 2005. The two teams exchanged field goals in the first quarter, with a 48-yarder by Colts' placekicker Adam Vinatieri and a 23-yarder by Broncos' placekicker Brandon McManus. A 4-yard touchdown run by running back C. J. Anderson gave the Broncos the lead early in the second quarter. Vinatieri and McManus once again exchanged field goals late in the first half, with a 52-yarder by Vinatieri and a 43-yarder by McManus just before halftime. The Colts took the initial possession of the second half and tied the game at 13–13 midway through the third quarter, with running back Robert Turbin rushing for a 5-yard touchdown. However, the Broncos took the lead for good later in the third quarter, with a 33-yard field goal by McManus. On the Colts' next possession, quarterback Andrew Luck was intercepted by Broncos' cornerback Aqib Talib, who scampered 46 yards down the sideline for a touchdown to give the Broncos a 23–13 lead early in the fourth quarter. Following an exchange of punts, the Colts narrowed the Broncos' lead, with Luck connecting with running back Frank Gore on a 7-yard touchdown pass with four minutes remaining in the game. The Broncos then increased their lead to 26–20 on the first play after the two-minute warning, with McManus' fourth field goal of the game — a 35-yarder, and in the process, forcing the Colts to burn all three of their team timeouts. The Colts had one last offensive possession, hoping for a game-winning drive, however, on the very first play from scrimmage, Luck was strip-sacked by Broncos' linebacker Von Miller, and linebacker Shane Ray returned the fumble 15 yards for a game-clinching touchdown (with a two-point conversion pass from quarterback Trevor Siemian to wide receiver Demaryius Thomas). Demaryius Thomas passed Ed McCaffrey for fourth-place on the Broncos' all-time career receptions list — Thomas only trails Lionel Taylor, Shannon Sharpe and Rod Smith. The Bengals grabbed the lead on their opening possession, with running back Jeremy Hill rushing for a 3-yard touchdown. The Broncos drove down to near the goal line on their second possession, which was aided by two Bengals' defensive penalties, however, the Broncos were forced to settle for a 20-yard field goal by placekicker Brandon McManus. Following a Bengals' fumble on a punt return near midfield, the Broncos took the lead, with quarterback Trevor Siemian connecting on a 41-yard touchdown pass to wide receiver Emmanuel Sanders. Following an exchange of punts, the Bengals went back ahead, with Hill rushing for his second touchdown — from 4 yards out. The Broncos responded, with Siemian throwing another touchdown pass to Sanders — from 7 yards out. However, the extra point attempt was blocked. Following a scoreless third quarter, a 34-yard field goal by placekicker Mike Nugent gave the Bengals a 17–16 lead early in the fourth quarter. The Broncos then assembled a 13-play, 82-yard drive, culminating with Siemian firing a 1-yard touchdown pass to tight end John Phillips (with an unsuccessful two-point conversion attempt). After the Bengals went three-and-out on their next possession, in which wide receiver A. J. Green dropped a critical third-down pass play, the Broncos added to their lead, with Siemian throwing his fourth touchdown of the game — a 55-yarder to wide receiver Demaryius Thomas with 4:32 remaining in the game. The Broncos' defense stood their ground on the Bengals' last two possessions. Trevor Siemian became the first quarterback in NFL history to throw for 300 yards and four touchdowns without an interception in a first career road start. With linebacker Shane Ray recording three sacks, this was the first time in franchise history in which the Broncos had two different players record 3+ sacks in a single game — linebacker Von Miller achieved three sacks vs. the Indianapolis Colts during the previous week. The Broncos made their first visit to Tampa Bay since 2004. Cornerback Aqib Talib, who made his return to Tampa Bay where he played for the Buccaneers from 2018–2012, intercepted Buccaneers' quarterback Jameis Winston on the third play of the opening drive. The Broncos immediately capitalized, with quarterback Trevor Siemian throwing an 11-yard touchdown to wide receiver Demaryius Thomas. On the Buccaneers' next drive, a 7-yard touchdown run by Winston tied the game, which would be the Buccaneers' only scoring play of the game. Following another interception of Winston by Talib, the Broncos re-claimed the lead, with a 1-yard touchdown run by running back C. J. Anderson. With 3:25 remaining in the first half, Siemian injured his non-throwing shoulder when he was sacked by defensive tackle Clinton McDonald, and backup quarterback Paxton Lynch, the team's first-round draft selection, took over in his NFL debut. Placekicker Brandon McManus added two field goals — a 38-yarder just before halftime and a 24-yarder midway through the third quarter. Lynch later threw his first touchdown pass — a 5-yarder to wide receiver Emmanuel Sanders, which put the game out of reach. At the 6:52 mark of the fourth quarter, the game was delayed for an hour and a half due to a severe weather threat in the Tampa area. The Falcons, making their first visit to Denver since 2004, took a 10–0 lead in the first quarter, with running back Devonta Freeman rushing for a 1-yard touchdown, followed by a 46-yard field goal by placekicker Matt Bryant. The Broncos, with quarterback Paxton Lynch, playing in place of the injured Trevor Siemian, punted on their first two possessions, and got on the scoreboard early in the second quarter, with a 35-yard field goal by placekicker Brandon McManus. Following an exchange of punts, a 33-yard field goal by Bryant just after the two-minute warning extended the Falcons' lead, in a drive that took seven minutes off the clock. In the third quarter, Lynch was intercepted by Falcons' safety Ricardo Allen at the Broncos' 42-yard line, and the Falcons capitalized, with quarterback Matt Ryan connecting on a 31-yard touchdown pass to running back Tevin Coleman to extend to a 20–3 lead. On the Falcons' next drive, Broncos' safety T. J. Ward forced a fumble off wide receiver Mohamed Sanu at midfield, though the Broncos had to settle for a 46-yard field goal by McManus early in the fourth quarter. The Falcons responded, with a 25-yard field goal by McManus to extend to a 23–6 lead with 8:24 remaining in the game. Hoping for a rally, the Broncos went on a 16-play, 78-yard drive, culminating in a 3-yard touchdown pass from Lynch to wide receiver Demaryius Thomas with 2:43 remaining. After an unsuccessful onside kick attempt, the Broncos' defense forced a three-and-out, but were forced to use all of their team timeouts prior to the two-minute warning. The Broncos advanced 44 yards in 7 plays, and pulled to within a 23–16 deficit, with a 45-yard field goal by McManus with only 19 seconds remaining. However, another onside kick attempt was unsuccessful, sealing the win for the Falcons. Demaryius Thomas became the third player in Broncos' franchise history to achieve 50 career touchdowns — the other two are Shannon Sharpe (55) and Rod Smith (68). The Chargers scored took a 10–0 lead, with quarterback Philip Rivers connecting on a 5-yard touchdown pass to tight end Hunter Henry, followed in the second quarter by a 37-yard field goal by placekicker Josh Lambo. Chargers' return specialist Travis Benjamin fumbled a punt return at the Chargers' 11-yard line, however, the Broncos did not gain any yardage, and were forced to settle for a 29-yard field goal by placekicker Brandon McManus. Three third-quarter field goals by Lambo — from 21, 31 and 32 yards out, added to the Chargers' lead. The middle score occurred after a fumble by Broncos' wide receiver Jordan Taylor. McManus missed wide-right on a 56-yard field goal at the end of the third quarter. Early in the fourth quarter, the Broncos' defense forced a Chargers' punt that backed up the Broncos to their own 3-yard line. On the next play from scrimmage, Broncos' offensive tackle Russell Okung was penalized for holding in the end zone that resulted in a safety, extending the Chargers' lead to 21–3. On the ensuing free kick, the Chargers committed another special teams turnover, with guard Kenny Wiggins fumbling the kick near midfield. The Broncos capitalized on this turnover, with a 5-yard touchdown pass from quarterback Trevor Siemian to wide receiver Bennie Fowler. The Broncos' defense forced a three-and-out on the Chargers' next possession with six minutes remaining in the game. On the sixth play of the Broncos' next drive, Siemian connected with running back C. J. Anderson on a 20-yard touchdown, however, another costly holding penalty on Okung negated the scoring play. Two plays later, Siemian connected on a pass completion to wide receiver Demaryius Thomas to the Chargers' 13-yard line, however, Chargers' linebacker Jatavis Brown forced a fumble off Thomas, which was recovered by cornerback Craig Mager, ending the drive with 3:35 remaining. The Broncos' defense forced another three-and-out, but used all three of their team timeouts in the process. A 46-yard field goal by McManus with 32 seconds remaining pulled the Broncos to within a 21–13 deficit. The Broncos recovered the onside kick at their own 46-yard line, however, four plays later, a desperation hail mary pass by Siemian fell short of the end zone. Special teams coordinator Joe DeCamillis served as interim head coach, while Gary Kubiak recovered from a migraine condition that he suffered during the previous week. As part of the NFL Color Rush program, the Broncos wore all-orange throwback uniforms. With the loss, the Broncos NFL-record 15-game road winning streak against division opponents came to an end. The Broncos' defense surrendered only three field goals by Texans' placekicker Nick Novak, and spoiled quarterback Brock Osweiler's return to Denver, allowing only 131 passing yards. Osweiler spent the previous four seasons (2012–2015) as Peyton Manning's backup quarterback, and started seven games in 2015 while Manning was injured. The Broncos scored three offensive touchdowns — a 4-yard pass from quarterback Trevor Siemian to Demaryius Thomas, plus two rushing touchdowns, one from C. J. Anderson, and the other from rookie Devontae Booker. Placekicker Brandon McManus also added two field goals. The Broncos wore wear their alternate navy blue uniforms for this game. This was Broncos' head coach Gary Kubiak's first victory against the Texans, for whom he coached from 2006–2013, as well as Kubiak's return to the sideline following a health scare that forced him to miss the team's Week 6 loss to the San Diego Chargers. During halftime, three former Broncos were inducted into the Ring of Fame: Placekicker Jason Elam, who played with the Broncos from 1993–2007 and is the franchise's all-time leader in field goals (395) and points scored (1,786); defensive lineman Simon Fletcher, who played with the Broncos from 1985–1995 and is the franchise's all-time leader in sacks (97.5) and consecutive games played (172); safety John Lynch, who played four seasons with the Broncos from 2004–2007. For the second time in a three-week span, the Broncos faced their AFC West rivals, the San Diego Chargers. Following a 28-yard field goal by placekicker Brandon McManus on the Broncos' opening possession, a 7-yard touchdown pass from quarterback Philip Rivers to tight end Antonio Gates gave the Chargers their only lead of the game. The Broncos' defense then proceeded to frustrate the Chargers' offense, including three interceptions of Rivers. In the second quarter, Broncos' cornerback Bradley Roby returned a interception 49 yards for a touchdown, and Chargers' placekicker Josh Lambo later missed on a 44-yard field goal attempt. On the Chargers' opening possession of the second half, the Broncos took advantage of a Rivers' interception deep in Chargers' territory, and added to their lead, with running back Devontae Booker rushing for a 3-yard touchdown. Rivers subsequently threw another interception deep in Chargers' territory — his third of the game, however, a fumble by Booker gave the football back to the Chargers. Thirteen plays and 98 yards later, the Chargers narrowed the Broncos' lead, with a 14-yard touchdown pass from Rivers to wide receiver Travis Benjamin. Broncos' linebacker Shaquil Barrett blocked the extra point attempt, keeping the score at 17–13. The Broncos responded early in the fourth quarter, with running back Juwan Thompson rushing for a 1-yard touchdown. On the Broncos' next possession, quarterback Trevor Siemian was intercepted by Chargers' cornerback Casey Hayward, who returned the football 16 yards for a touchdown. The initial two-point conversion pass from Rivers to Gates was successful, however, it was nullified by an offensive pass interference penalty on Gates. Rivers' second attempt intended for tight end Hunter Henry was incomplete, keeping the score at 24–19 with 8:10 remaining in the game. Two long pass plays from Siemian — one to tight end Virgil Green for 31 yards and another to wide receiver Demaryius Thomas for 40 yards — gave the Broncos a first-and-goal at the 4-yard line. However, the Chargers' defense forced the Broncos to settle for a 22-yard field goal by McManus. The Chargers attempted a rally, and with 2:54 remaining, the Chargers had a first-and-goal at the 2-yard line, but Rivers threw four consecutive incompletions, the last of which was knocked away by Broncos' cornerback Lorenzo Doss at the goal line. While backed up deep in their own territory, the Broncos' offense went three-and-out, and were forced to punt, giving the Chargers one last possession. The Broncos' defense stood their ground, not allowing the Chargers to advance past midfield. Broncos' defensive coordinator Wade Phillips was rushed to a Denver-area hospital, following a second-quarter sideline collision after Chargers' running back Melvin Gordon was blocked into him. Linebackers coach Reggie Herring filled in for Phillips for the remainder of the game. The Raiders dominated the time of possession by a 2–1 margin, and though the Broncos' defense limited Raiders' quarterback Derek Carr to 184 yards rushing, running back Latavius Murray amassed 114 rushing yards as well as three touchdowns. The Broncos rushed for only 33 yards, the lowest output of the season. The Broncos trailed 23–13 with eight minutes remaining in the game, and attempted a rally, however, quarterback Trevor Siemian was strip-sacked by Raiders' linebacker Khalil Mack, giving the Raiders a short field. A 1-yard touchdown by Murray extended the lead — a drive that was kept alive by one defensive holding and two pass interference penalties on Broncos' cornerback Chris Harris, Jr. On the Broncos' next drive, Siemian connected with running back Kapri Bibbs on a 69-yard touchdown pass to pull to within a 30–20 deficit, but the Broncos got no closer. The Broncos, making their first visit to New Orleans since 2004, jumped out to a 10–0 lead. First, quarterback Trevor Siemian connected with wide receiver Jordan Taylor on a 14-yard touchdown pass. The touchdown was initially ruled as an incomplete pass, but overturned by a replay challenge. Following an interception of Saints' quarterback Drew Brees by cornerback Darian Stewart, placekicker Brandon McManus added a 50-yard field goal early in the second quarter. The Broncos were attempting to add to their lead just before halftime, however Siemian was intercepted by cornerback Sterling Moore, and the Saints quickly advanced 50 yards in only 29 seconds, culminating in a 30-yard field goal by placekicker Will Lutz. Early in the third quarter, the Saints tied the game, with Brees connecting with wide receiver Willie Snead on a 3-yard touchdown pass. On the Broncos' second possession of the second half, Siemian was intercepted by safety Kenny Vaccaro, and four plays later, another touchdown pass from Brees to Snead — from 5 yards out — gave the Saints a 17–10 lead. On the Broncos next drive, McManus missed wide left on a 42-yard field attempt early in the fourth quarter. Two plays into the Saints' next possession, Broncos' cornerback Bradley Roby forced a fumble off wide receiver Michael Thomas, which was recovered by Stewart at the Saints' 27-yard line. Seven plays later, the Broncos tied the game, with a 2-yard touchdown pass from Siemian to wide receiver Demaryius Thomas. After forcing the Saints to go three-and-out, the Broncos drove down the field, but had to settle on a 28-yard field goal by McManus. The Broncos' defense forced another fumble deep in Saints' territory, but had to settle on a 37-yard field goal by McManus with 2:50 remaining in the game, while forcing the Saints to burn the last two of their three team timeouts. The Saints then drove 75 yards in only six plays, culminating in Brees throwing a 32-yard touchdown pass to wide receiver Brandin Cooks to tie the game at 23–23 with 1:30 remaining in the game. However, Lutz's extra point attempt was blocked by Justin Simmons, and Will Parks scooped up the football and ran to the end zone for a defensive two-point conversion. The Saints claimed that Parks may have stepped out of bounds, but the initial ruling on the field was upheld after an instant replay review. The Saints' onside kick attempt was unsuccessful, sealing the win for the Broncos. Darian Stewart became the Broncos' first defensive player since Deltha O'Neal in 2001 to record three takeaways in one game. After a scoreless first quarter, the Chiefs took a 9–0 lead midway through the second quarter. Running back Tyreek Hill returned a kickoff 86 yards for a touchdown. This was preceded by a safety, after Broncos' quarterback Trevor Siemian was strip-sacked near the goal line and offensive tackle Russell Okung was tackled in the end zone trying to recover the fumble. A 33-yard field goal by placekicker Brandon McManus just after the two-minute warning put the Broncos on the scoreboard. The Broncos grabbed the lead midway through the third quarter, with a 6-yard touchdown pass from Siemian to wide receiver Jordan Taylor. The Chiefs responded on their next possession, with Hill rushing for a 3-yard touchdown. The drive was extended after the Chiefs accepted an illegal formation penalty on the Broncos that nullified a 35-yard field goal by placekicker Cairo Santos. The Broncos re-claimed the lead midway through the fourth quarter, with a 35-yard touchdown pass from Siemian to wide receiver Emmanuel Sanders. After forcing a Chiefs' punt, the Broncos were attempting to run out the clock after earning a first down with 3:31 remaining in the game. Two plays later, and after the Chiefs had used all of their team timeouts, the Broncos extended their lead to 24–16, with a 76-yard touchdown pass from Siemian to wide receiver Bennie Fowler. However, the Broncos' defense was unable to keep the Chiefs out of the end zone. Quarterback Alex Smith methodically engineered a game-tying 13-play, 75-yard drive, with a 2-yard touchdown pass to Hill, coupled with a two-point conversion pass to tight end Demetrius Harris. The play was initially ruled down at the 1-yard line with 15 seconds remaining, but overturned by instant replay, sending the game to overtime. The Broncos won the overtime coin toss, and each team exchanged field goals on their initial possessions — a 44-yarder by Brandon McManus followed by a 37-yarder by Santos. The Broncos' next overtime possession commenced with 4:19 remaining, and drove to as far as the Chiefs' 44-yard line. Instead of a short punt, Broncos' head coach Gary Kubiak elected to send McManus onto the field for a potential game-winning 62-yard field goal, however, McManus attempt was both short and wide left, giving the Chiefs possession at the Broncos' 48-yard line with 1:08 remaining. Four plays later, and with five seconds remaining, Santos kicked the game-winning 34-yard field goal for the Chiefs, which initially caromed off the left upright. Trying to rebound from their loss, the Broncos will head to Jacksonville to take on the struggling Jaguars. Team statistics updated through Week 12. League statistics updated through Week 12. On March 12, linebacker DeMarcus Ware agreed to a re-structured contract with the Broncos. Ware, who signed a three-year, $30 million contract with the Broncos in 2014, had his 2016 salary reduced from $7 million to $6.5 million, but can earn back money with incentives. On August 25, executive vice president/general manager John Elway was added to the NFL's competition committee. On September 7, the Broncos and wide receiver Emmanuel Sanders agreed on a three-year contract extension that will keep Sanders in Denver through the 2019 season. The initial three-year contract that Sanders signed with the Broncos in 2014 was set to expire after the 2016 season. 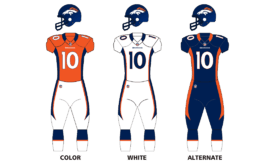 On September 13, the Broncos' Color Rush uniforms were unveiled, which the team wore during their Week 6 Thursday Night loss at the San Diego Chargers. The uniform kit contained the following features: orange pants, which the team wore for the first time since 1979, orange socks and shoes, as well as block-style numerals trimmed in navy blue that mirrored the team's 1968–96 uniform style. Due to the NFL's one-helmet rule implemented in 2013, the helmets remained the same, with the team temporarily replacing the modern primary logo with the throwback "D" horse logo. On November 26, the Broncos and safety Darian Stewart agreed on a four-year contract extension that will keep Stewart in Denver through the 2020 season. The initial two-year contract that Stewart signed with the Broncos in 2015 was set to expire after the 2016 season. As the result of a negative differential of free agent signings and departures that the Broncos experienced during the 2016 free agency period, the team is expected to receive three compensatory selections for the 2017 draft. Free agent transactions that occur after May 12, 2016 will not impact the team's formula for determining compensatory selections for the 2017 draft. ↑ Renck, Troy (February 12, 2016). "Brian Callahan, Broncos offensive quality control coach, hired by Lions". The Denver Post. Retrieved February 12, 2016. ↑ Jhabvala, Nicki (October 10, 2016). "Gary Kubiak diagnosed with "complex migraine," will not coach Thursday in San Diego". The Denver Post. Retrieved October 10, 2016. ↑ Smith, Michael David (March 10, 2016). "Dolphins sign C.J. Anderson to offer sheet". NBC Sports. Retrieved March 10, 2016. ↑ Renck, Troy (March 15, 2016). "C.J. Anderson stays put as Broncos match Dolphins' offer sheet". The Denver Post. Retrieved March 15, 2016. 1 2 Jhabvala, Nicki (October 29, 2016). "Broncos sign RB Juwan Thompson from practice squad". The Denver Post. Retrieved October 29, 2016. ↑ Renck, Troy (March 31, 2016). "Broncos' Omar Bolden agrees to deal with Chicago Bears". The Denver Post. Retrieved March 31, 2016. 1 2 Wolfe, Cameron (April 15, 2016). "Bennie Fowler, Sam Brenner sign tenders to return to Broncos for 2016 season". The Denver Post. Retrieved April 15, 2016. 1 2 Wolfe, Cameron (August 5, 2016). "Broncos waive Sam Brenner; sign rookie OL to bolster depth for second straight day". The Denver Post. Retrieved August 5, 2016. ↑ "Safety David Bruton signs three-year deal with Washington". The Denver Post. March 15, 2016. Retrieved March 15, 2016. ↑ Rothstein, Michael (May 4, 2016). "Lions sign former Broncos receiver Andre Caldwell to one-year deal". ESPN. Retrieved May 4, 2016. ↑ Renck, Troy (March 31, 2016). "Vernon Davis signs with Washington Redskins in an expected departure". The Denver Post. Retrieved March 31, 2016. ↑ Renck, Troy (March 15, 2016). "Ryan Harris joining Pittsburgh Steelers on two-year deal". The Denver Post. Retrieved March 15, 2016. ↑ Jhabvala, Nicki (April 18, 2016). "Ronnie Hillman, Broncos agree to one-year contract". The Denver Post. Retrieved April 18, 2016. 1 2 3 4 5 6 7 8 9 10 11 12 13 14 15 16 17 18 19 20 21 22 Mason, Andrew (September 2, 2016). "Broncos make 23 moves to pare roster at the deadline". Denver Broncos. Retrieved September 2, 2016. ↑ Wesseling, Chris (September 21, 2016). "Vikings sign former Broncos RB Ronnie Hillman". NFL. Retrieved September 21, 2016. ↑ Renck, Troy (March 8, 2016). "Malik Jackson agrees to 6-year deal with Jacksonville Jaguars". The Denver Post. Retrieved March 8, 2016. 1 2 Jhabvala, Nicki (April 18, 2016). "Broncos sign safeties Shiloh Keo, Brandian Ross to one-year contracts". The Denver Post. Retrieved April 18, 2016. 1 2 Jhabvala, Nicki (August 12, 2016). "Broncos safety Shiloh Keo suspended by NFL for two games". The Denver Post. Retrieved August 12, 2016. 1 2 Jhabvala, Nicki (October 25, 2016). "Broncos acquire tight end A.J. Derby in trade with Patriots". The Denver Post. Retrieved October 25, 2016. ↑ Katzenstein, Josh (November 9, 2016). "New Orleans Saints sign safety Shiloh Keo, Sean Payton says". NOLA.com. Retrieved November 9, 2016. ↑ Renck, Troy (March 21, 2016). "Brandon Marshall could be long-term keeper at linebacker". The Denver Post. Retrieved March 21, 2016. ↑ Renck, Troy (June 14, 2016). "Broncos agree to four-year extension with LB Brandon Marshall". The Denver Post. Retrieved June 14, 2016. 1 2 Renck, Troy (March 17, 2016). "Russell Okung agrees to five-year deal with Broncos to bolster O-line". The Denver Post. Retrieved March 17, 2016. ↑ Wolfe, Cameron (April 18, 2016). "Lerentee McCray leaves Broncos, signs with Green Bay Packers". The Denver Post. Retrieved April 18, 2016. ↑ Swanson, Ben (April 19, 2016). "K Brandon McManus signs exclusive rights free-agent tender". Denver Broncos. Retrieved April 19, 2016. ↑ Renck, Troy (March 1, 2016). "Von Miller receives exclusive franchise tag from Broncos". The Denver Post. Retrieved March 1, 2016. ↑ Renck, Troy (July 15, 2016). "Von Miller agrees to six-year, $114.5 million contract with Broncos". The Denver Post. Retrieved July 15, 2016. ↑ Jhabvala, Nicki (March 23, 2016). "Jordan Norwood returning to Broncos on one-year deal". The Denver Post. Retrieved March 23, 2016. 1 2 Renck, Troy (March 9, 2016). "Brock Osweiler agrees to four-year deal with Houston Texans; Broncos could eye Colin Kaepernick". The Denver Post. Retrieved March 9, 2016. ↑ Wolfe, Cameron (April 15, 2016). "Matt Paradis signs tender with Broncos; Nick Kasa waived". The Denver Post. Retrieved April 15, 2016. ↑ Jhabvala, Nicki (April 5, 2016). "Tyler Polumbus, former Broncos tackle, announces retirement from NFL". The Denver Post. Retrieved April 5, 2016. ↑ Sidhu, Deepi (September 28, 2016). "Antonio Smith on new role and returning "home"". Houston Texans. Retrieved September 28, 2016. ↑ "Trevathan signs deal with Bears". The Denver Post. March 9, 2016. Retrieved March 9, 2016. ↑ Alper, Josh (June 17, 2016). "Jets sign former 49ers wideout Kyle Williams". NBC Sports. Retrieved June 17, 2016. ↑ Renck, Troy (January 15, 2016). "Broncos sign DE Derek Wolfe to four-year contract extension". The Denver Post. Retrieved January 15, 2016. ↑ Jhabvala, Nicki (July 27, 2016). "Broncos sign WR Marlon Brown, waive RB Cyrus Gray". The Denver Post. Retrieved July 27, 2016. 1 2 Jhabvala, Nicki (August 4, 2016). "Broncos sign former CSU OL Sam Carlson, waive injured WR Marlon Brown". The Denver Post. Retrieved August 4, 2016. 1 2 Jhabvala, Nicki (November 21, 2016). "Broncos re-sign WR Marlon Brown, waive CB Taurean Nixon". The Denver Post. Retrieved November 21, 2016. ↑ Wolfe, Cameron (April 6, 2016). "Broncos agree to two-year deal with defensive end Jared Crick". The Denver Post. Retrieved April 6, 2016. 1 2 Jhabvala, Nicki (November 25, 2016). "Broncos sign long snapper Thomas Gafford, waive nose tackle Darius Kilgo". The Denver Post. Retrieved November 25, 2016. ↑ Jhabvala, Nicki (January 12, 2016). "Denver Broncos sign three more players to future contracts". The Denver Post. Retrieved January 12, 2016. 1 2 Mason, Andrew (July 28, 2016). "Broncos sign TE John Phillips, waive TE Manasseh Garner". The Denver Post. Retrieved July 28, 2016. 1 2 Jhabvala, Nicki (August 19, 2016). "Broncos place DE Vance Walker on IR, re-sign TE Manasseh Garner". The Denver Post. Retrieved August 19, 2016. 1 2 3 4 5 6 7 8 9 Mason, Andrew (August 29, 2016). "Broncos part ways with 11 as 75-man deadline nears". Denver Broncos. Retrieved August 29, 2016. 1 2 Mason, Andrew (February 22, 2016). "Broncos add DT Phil Taylor and TE Richard Gordon". Denver Broncos. Retrieved February 22, 2016. ↑ Jhabvala, Nicki (May 4, 2016). "Broncos waive tight end Richard Gordon. Again.". The Denver Post. Retrieved May 4, 2016. ↑ Renck, Troy (April 25, 2016). "Broncos sign Garrett Graham, adding experience at tight end". The Denver Post. Retrieved April 25, 2016. 1 2 3 Mason, Andrew (August 30, 2016). "Broncos release Britton Colquitt, make three other moves to get down to 75". Denver Broncos. Retrieved August 30, 2016. ↑ Mason, Andrew (April 7, 2016). "Broncos add long snapper Casey Kreiter". Denver Broncos. Retrieved April 7, 2016. 1 2 Jhabvala, Nicki (August 22, 2016). "Broncos add long snapper Casey Kreiter". The Denver Post. Retrieved August 22, 2016. 1 2 Wolfe, Cameron (August 8, 2016). "Broncos waive oft-injured DE Kenny Anunike; re-sign safety Ryan Murphy". The Denver Post. Retrieved August 8, 2016. 1 2 3 4 5 6 7 Swanson, Ben (September 4, 2016). "Broncos add eight to practice squad". Denver Broncos. Retrieved September 4, 2016. 1 2 Mason, Andrew (May 10, 2016). "Broncos awarded fullback Toben Opurum via waivers". Denver Broncos. Retrieved May 10, 2016. ↑ Jhabvala, Nicki (May 12, 2016). "Broncos sign sixth-round draft picks Andy Janovich, Will Parks". The Denver Post. Retrieved May 12, 2016. 1 2 Jhabvala, Nicki (November 5, 2016). "Broncos promote CB Taurean Nixon, release TE John Phillips". The Denver Post. Retrieved November 5, 2016. ↑ Swanson, Ben (March 10, 2016). "Broncos agree to terms with T Donald Stephenson on three-year contract". Denver Broncos. Retrieved March 10, 2016. 1 2 Mason, Andrew (July 31, 2016). "Broncos place NT Phil Taylor on injured reserve; sign DE Billy Winn". Denver Broncos. Retrieved July 31, 2016. 1 2 Wolfe, Cameron (October 17, 2016). "Broncos claim OL Billy Turner; waive OL Darrion Weems". The Denver Post. Retrieved October 17, 2016. ↑ Jhabvala, Nicki (May 16, 2016). "Broncos sign veteran unrestricted free-agent Dekoda Watson". The Denver Post. Retrieved May 16, 2016. 1 2 3 Mason, Andrew (March 8, 2016). "Broncos release Louis Vasquez, Owen Daniels and Aaron Brewer". Denver Broncos. Retrieved March 8, 2016. ↑ Renck, Troy (March 7, 2016). "Peyton Manning retires from football: "I love the game...I will miss it."". The Denver Post. Archived from the original on March 9, 2016. Retrieved September 8, 2016. ↑ Mason, Andrew (March 6, 2016). "Peyton Manning: A career by the numbers". Denver Broncos. Retrieved March 6, 2016. ↑ Shook, Nick (November 27, 2016). "Patriots' Tom Brady reaches career win No. 200". NFL. Retrieved November 27, 2016. 1 2 Terranova, Justin (August 23, 2016). "Is this the end for Mark Sanchez?". New York Post. Retrieved August 23, 2016. 1 2 Renck, Troy (March 11, 2016). "Mark Sanchez acquired by Denver Broncos for 2017 draft pick". The Denver Post. Retrieved March 11, 2016. 1 2 Renck, Troy; Jhabvala, Nicki (April 9, 2016). "Broncos trade Ryan Clady, 7th-rounder to Jets for 5th-round pick". The Denver Post. Retrieved April 9, 2016. ↑ Wolfe, Cameron (June 9, 2016). "Broncos, Paxton Lynch agree to four-year deal". The Denver Post. Retrieved June 9, 2016. ↑ Jhabvala, Nicki (April 28, 2016). "Broncos trade up, take QB Paxton Lynch at No. 26". The Denver Post. Retrieved April 28, 2016. ↑ Swanson, Ben (May 25, 2016). "Broncos sign second-round pick Adam Gotsis". Denver Broncos. Retrieved May 25, 2016. 1 2 Mason, Andrew (May 13, 2016). "Broncos sign draft picks Devontae Booker and Justin Simmons". Denver Broncos. Retrieved May 13, 2016. ↑ Renck, Troy (April 1, 2015). "Broncos acquire center Gino Gradkowski in trade with Ravens". The Denver Post. Retrieved April 1, 2015. ↑ DiLalla, Aric (May 16, 2016). "McGovern inks rookie deal". Denver Broncos. Retrieved May 16, 2016. ↑ Jhabvala, Nicki (August 31, 2015). "Chris Clark, Broncos OL, traded to Texans for 2016 draft pick". The Denver Post. Retrieved August 31, 2015. ↑ "NFL draft trade tracker". ESPN. April 30, 2016. Retrieved April 30, 2016. ↑ DeChant, David (April 30, 2015). "Broncos trade up for Missouri LB Shane Ray in first round of 2015 NFL Draft". Denver Broncos. Retrieved April 30, 2015. 1 2 Mason, Andrew (May 12, 2016). "Broncos sign sixth-round picks Andy Janovich, Will Parks". Denver Broncos. Retrieved May 12, 2016. 1 2 Jhabvala, Nicki (December 1, 2016). "Andy Janovich has season-ending ankle surgery, will go on IR". The Denver Post. Retrieved December 1, 2016. ↑ Renck, Troy (November 2, 2015). "Vernon Davis traded to Denver Broncos from San Francisco". The Denver Post. Retrieved November 2, 2015. ↑ Mason, Andrew (May 11, 2016). "Broncos' draft pick signings begin with Riley Dixon". Denver Broncos. Retrieved May 11, 2016. ↑ Mason, Andrew (March 11, 2016). "Broncos get three compensatory picks, including third-rounder". Denver Broncos. Retrieved March 11, 2016. ↑ Mason, Andrew (May 2, 2016). "Get to know the Broncos' 21 college free agents". Denver Broncos. Retrieved May 2, 2016. 1 2 Jhabvala, Nicki (August 2, 2016). "Broncos sign rookie DL Lars Koht, waive DE Shaneil Jenkins". The Denver Post. Retrieved August 2, 2016. ↑ Swanson, Ben (September 4, 2016). "Broncos add LB Kyle Kragen to practice squad". Denver Broncos. Retrieved September 4, 2016. ↑ Jhabvala, Nicki (September 20, 2016). "Broncos to bring back S Shiloh Keo, waive DL Kyle Peko". The Denver Post. Retrieved September 20, 2016. ↑ Swanson, Ben (September 22, 2016). "Broncos sign NT Kyle Peko to practice squad, waive S Ryan Murphy". Denver Broncos. Retrieved September 22, 2016. ↑ Swanson, Ben (September 5, 2016). "Broncos round out practice squad with Kalif Raymond". Denver Broncos. Retrieved September 5, 2016. ↑ Wolfe, Cameron (December 2, 2016). "Broncos promote Kalif Raymond to 53-man roster as new punt returner; Andy Janovich to IR". The Denver Post. Retrieved December 2, 2016. 1 2 Mason, Andrew (July 26, 2016). "Broncos sign rookie LB Darnell Sankey; waive long snapper Nathan Theus". Denver Broncos. Retrieved July 26, 2016. ↑ Jhabvala, Nicki (August 12, 2016). "Broncos WR Bennie Fowler to miss time with elbow fracture". The Denver Post. Retrieved August 12, 2016. ↑ Jhabvala, Nicki (August 15, 2016). "Broncos DE Vance Walker done for season with torn ACL". The Denver Post. Retrieved August 15, 2016. 1 2 Jhabvala, Nicki (October 30, 2016). "Broncos' Aqib Talib, Brandon Marshall out; DeMarcus Ware to play vs. Chargers". The Denver Post. Retrieved October 30, 2016. ↑ Jhabvala, Nicki (September 19, 2016). "Broncos' DeMarcus Ware to have surgery on forearm; out 4-5 weeks". The Denver Post. Retrieved September 19, 2016. 1 2 Jhabvala, Nicki (October 2, 2016). "Aqib Talib, rookie QB Paxton Lynch star in Broncos' storm-delayed win vs. Bucs". The Denver Post. Retrieved October 2, 2016. 1 2 Jhabvala, Nicki (October 9, 2016). "Denver Broncos dealt first loss in Paxton Lynch's first NFL start". The Denver Post. Retrieved October 9, 2016. ↑ Jhabvala, Nicki (October 27, 2016). "Broncos RB C.J. Anderson undergoing further tests, strong possibility of missing time". The Denver Post. Retrieved October 27, 2016. ↑ "Broncos RB C.J. Anderson has meniscus damage, out indefintely". ESPN. October 27, 2016. Retrieved October 27, 2016. ↑ Jhabvala, Nicki (October 28, 2016). "Broncos' C.J. Anderson has meniscus repaired and is placed on IR". The Denver Post. Retrieved October 28, 2016. ↑ Jhabvala, Nicki (November 7, 2016). "Broncos receive "encouraging news" about Derek Wolfe's elbow injury; Aqib Talib day-to-day". The Denver Post. Retrieved November 7, 2016. ↑ Jhabvala, Nicki (November 13, 2016). "Broncos CB Aqib Talib declares he'll return for Broncos' Nov. 27 game vs. Chiefs". The Denver Post. Retrieved November 13, 2016. ↑ Paige, Woody (May 27, 2016). "Paige: Denver Broncos find themselves in yet another quarterback controversy". The Denver Post. Retrieved May 27, 2016. ↑ Jhabvala, Nicki (August 29, 2016). "Trevor Siemian named Broncos' starting quarterback for season opener". The Denver Post. Retrieved August 29, 2016. ↑ Swanson, Ben (April 14, 2016). "Broncos' 2016 regular-season schedule released". Denver Broncos. Retrieved April 14, 2016. 1 2 3 Jhabvala, Nicki (September 8, 2016). "Defense's big plays key Broncos victory in season opener vs. Panthers". The Denver Post. Retrieved September 8, 2016. ↑ Groke, Nick; Wolfe, Cameron; Jhabvala, Nicki (September 8, 2016). "Andy Janovich is 3rd Broncos rookie to score on first career rushing attempt". The Denver Post. Retrieved September 8, 2016. 1 2 Jhabvala, Nicki (September 18, 2016). "Denver Broncos defense fends off Indianapolis Colts for 34-20 win". The Denver Post. Retrieved September 18, 2016. ↑ "Denver Broncos Career Receiving Leaders". pro-football-reference.com. September 18, 2016. Retrieved September 18, 2016. ↑ Jhabvala, Nicki (September 25, 2016). "Trevor Siemian, Broncos' star receiving duo shine in road win against Bengals". The Denver Post. Retrieved September 25, 2016. ↑ Jhabvala, Nicki (September 25, 2016). "Fun facts, key stats from Denver Broncos' victory at Cincinnati Bengals". The Denver Post. Retrieved September 25, 2016. ↑ DiLalla, Aric (October 9, 2016). "Next-Day Notebook: Demaryius Thomas reaches key mark". Denver Broncos. Retrieved October 9, 2016. 1 2 Jhabvala, Nicki (October 13, 2016). "Denver Broncos come unglued in loss to San Diego Chargers on the road". The Denver Post. Retrieved October 13, 2016. ↑ Jhabvala, Nicki (October 24, 2016). "As promised, Broncos ruin Brock Osweiler's return to Denver in win over Texans". The Denver Post. Retrieved October 24, 2016. ↑ Jhabvala, Nicki (October 18, 2016). "Broncos to wear alternate all-blue uniforms against Texans". The Denver Post. Retrieved October 18, 2016. ↑ Jhabvala, Nicki (October 24, 2016). "Aqib Talib presents Gary Kubiak with game ball after Broncos' win vs. Texans". The Denver Post. Retrieved October 24, 2016. ↑ Saunders, Patrick (October 24, 2016). "Broncos Ring of Fame inductees Simon Fletcher, Jason Elam, John Lynch salute fans, owner Pat Bowlen". The Denver Post. Retrieved October 24, 2016. 1 2 Jhabvala, Nicki (October 30, 2016). "Defense's big plays key Denver Broncos' victory over San Diego Chargers". The Denver Post. Retrieved October 30, 2016. ↑ Groke, Nick (October 30, 2016). "Wade Phillips leaves Broncos game on a stretcher after in-game collision". The Denver Post. Retrieved October 30, 2016. ↑ Jhabvala, Nicki (November 6, 2016). "Denver Broncos lose ugly to Oakland Raiders, fall to third place in AFC West". The Denver Post. Retrieved November 6, 2016. 1 2 Jhabvala, Nicki (November 13, 2016). "Broncos' secondary provides sparks in thrilling victory over Saints". The Denver Post. Retrieved November 13, 2016. 1 2 Jhabvala, Nicki (November 26, 2016). "Broncos agree to 4-year extension with safety Darian Stewart". The Denver Post. Retrieved November 26, 2016. 1 2 Jhabvala, Nicki (November 27, 2016). "Broncos blow lead late in regulation, lose to Chiefs in overtime". The Denver Post. Retrieved November 27, 2016. ↑ "Denver Broncos Team Statistics". Denver Broncos. November 28, 2016. Retrieved November 28, 2016. ↑ "NFL.com Statistics". NFL.com. November 29, 2016. Retrieved November 29, 2016. ↑ Deisley, Caroline (September 21, 2016). "Von Miller named AFC Defensive Player of the Week". Denver Broncos. Retrieved September 21, 2016. ↑ "Von Miller named AFC Defensive Player of the Month". Denver Broncos. September 29, 2016. Retrieved September 29, 2016. ↑ Deisley, Caroline (November 2, 2016). "Bradley Roby named AFC Defensive Player of the Week". Denver Broncos. Retrieved November 2, 2016. ↑ DiLalla, Aric (September 28, 2016). "Trevor Siemian named AFC Offensive Player of the Week". Denver Broncos. Retrieved September 28, 2016. ↑ DiLalla, Aric (November 16, 2016). "Justin Simmons named AFC Special Teams Player of the Week". Denver Broncos. Retrieved November 16, 2016. ↑ Renck, Troy (March 12, 2016). "DeMarcus Ware agrees to restructure contract with Broncos". The Denver Post. Retrieved March 12, 2016. ↑ Mason, Andrew (August 25, 2016). "Joe Ellis, John Elway join prestigious league committees". Denver Broncos. Retrieved August 25, 2016. ↑ Mason, Andrew (September 7, 2016). "Broncos agree to terms with WR Emmanuel Sanders on a contract extension". Denver Broncos. Retrieved September 7, 2016. ↑ Mason, Andrew (September 13, 2016). "NFL reveals Color Rush jersey for the Broncos". Denver Broncos. Retrieved September 13, 2016. ↑ Florio, Mike (May 9, 2016). "May 12 could dust off free-agent market". NBC Sports. Retrieved May 9, 2016. Wikimedia Commons has media related to 2016 Denver Broncos season.